The geosciences are one of the fields leading the way in advancing semantic technologies. 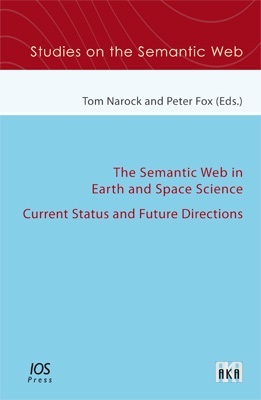 This book continues the dialogue and feedback between the geoscience and semantic web communities. Increasing data volumes within the geosciences makes it no longer practical to copy data and perform local analysis. Hypotheses are now being tested through online tools that combine and mine pools of data. This evolution in the way research is conducted is commonly referred to as e-Science. As e-Science has flourished the barriers to free and open access to data have been lowered and the need for semantics has been heighted. As the volume, complexity, and heterogeneity of data resources grow, geoscientists are creating new capabilities that rely on semantic approaches. Geoscience researchers are actively working toward a research environment of software tools and interfaces to data archives and services with the goals of full-scale semantic integration beginning to take shape. The members of this emerging semantic e-Science community are increasingly in need of semantic-based methodologies, tools, and infrastructure. A feedback system between the geo and computational sciences is forming. Advances in knowledge modeling, logic-based hypothesis checking, semantic data integration, and knowledge discovery are leading to advances in scientific domains, which in turn are validating semantic approaches and pointing to new research directions. We present mature semantic applications within the geosciences and stimulate discussion on emerging challenges and new research directions.